The online share of retail sales have undoubtedly risen in all countries for years and will continue to rise. According to experts the marketshare of e-commerce will increase across all industries to about 30-35% in the medium-term. But, these online shares vary from country to country; while online shares are relatively high in the north and west of Europe, low values are recorded in the south and east. 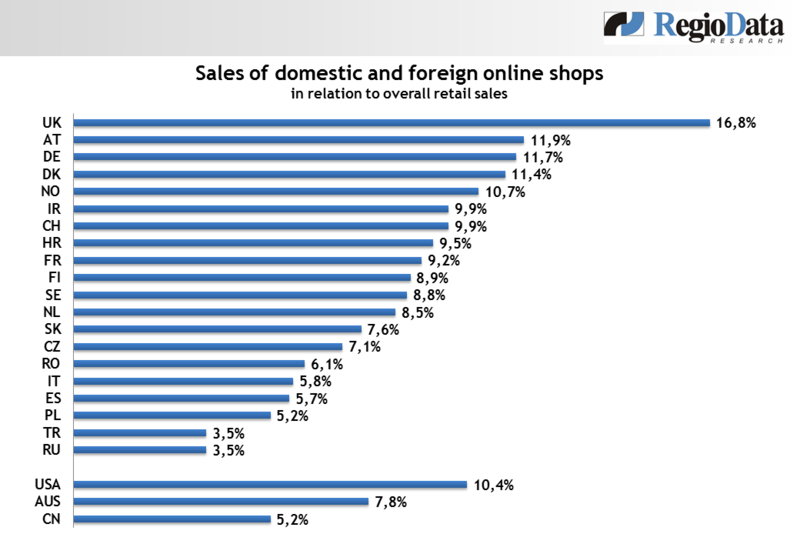 Front runners like the UK already stand at nearly 17% of total retail sales, while Turkey or Russia stands at 3.5%. 1. Purchasing power: The higher the purchasing power, the higher the share of online purchases. With a high purchasing power, remains more money for things that are not really necessary, but desirable. And in contrast to groceries, that each of us has to buy, the offer of desirable goods on the internet is already easily available and mature. 2. Providers: Professional providers in an industry increase online shares. For example, Great Britian has the highest share of e-commerce, because even in the food sector inhabitants are shopping a lot online. In turn, this is due to the fact that Tesco & Co make a broad and attractive array available online. Similar increases could be observed for example in Germany and Austria through the entry of Zalando. 3. The trade concentration: The fewer trading companies are operating in the individual sectors within a country, the higher are the online shares. Austria, the Scandinavian countries or Switzerland are mentioned here as an example. 4. The logistics: The possibilities and the degree of maturity of logistics services are also crucial for the development of the online trade within a country. If a quick delivery of ordered goods is not possible, because of the size of a country, poor infrastructure or lack of transport facilities, the stationary trade is of course more likely to stand out.